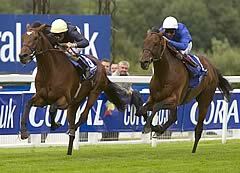 Remarkably, the official British Horseracing Authority performance rating for Nathaniel’s Coral-Eclipse victory on Saturday was 124, exactly the same as the rating for the winners of the three earlier middle distance Group 1 contests in the 2012 QIPCO British Champions Series. Camelot clocked 124 in the Investec Derby, St Nicholas Abbey did the same in the Diamond Jubilee Coronation Cup (sponsored by Investec) and likewise So You Think in the Prince of Wales’s Stakes. There is therefore a four-way tie at the top of the QIPCO British Champions Middle Distance performance table with the next race, the King George VI and Queen Elizabeth Stakes (sponsored by Betfair), taking place at Ascot a week on Saturday (July 21). “We introduced these tables in order to provide an informative comparison between the season’s top performances and it’s quite remarkable to see the four middle distance winners all on identical ratings,” said British Champions Series Chief Executive, Rod Street. “A possible clash between Nathaniel, if he recovers in time, and St Nicholas Abbey in the Betfair King George on Saturday week would be very likely to produce a table-topping performance....at least, that is, until Frankel enters the middle distance fray in the Juddmonte International at York in August! Nathaniel’s 124 was two pounds below his best to date, the 126 he clocked in last year’s Betfair King George, but it was an outstanding performance considering it was his first run of the season following illness in the spring. The lightly-raced Farhh took another step forward, clocking 122 which will be his new official rating, a rise of four pounds on the 118 he clocked in the Prince of Wales’s Stakes at Royal Ascot. He could well be capable of more still in the months ahead. The veteran Twice Over ran his best race of the season with a performance rating of 117 in third place. However, that is still two pounds below his current official rating of 119 and well below the 125 he achieved when winning the Juddmonte International last year. Nathaniel’s victory enabled John Gosden and William Buick to close the gap on clear leaders Aidan and Joseph O’Brien in the Trainer and Jockey of the Series tables. O’Brien senior’s lead has been cut to 75 points over Gosden, while O’Brien junior retains a 55 point lead over Buick and Ryan Moore who are now tied on 50 points. NOTE: To qualify for entry into the Performance Tables, which use BHA performance ratings, a horse must finish in the first three in a QIPCO British Champions Series race. Performance ratings may retrospectively be changed if the handicappers revise their ratings for a race in the light of subsequent results.